Yes, he jumped, even though being pushed was surely looming on the horizon ahead. 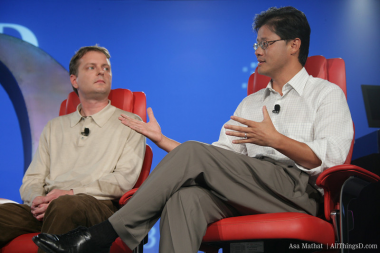 But the decision of Yahoo co-founder, former CEO and director Jerry Yang to leave Yahoo was indeed sudden, with the board meeting just this morning about the issue. It was so sudden, in fact, that Yahoo’s key execs — including its communications arm — had only a few minutes heads-up to what is arguably one of the more momentous events in the history of the Silicon Valley Internet giant. In fact, newly installed CEO Scott Thompson was in Los Angeles in a previously planned visit to meet his new staffers, said multiple sources, forcing him to participate in the board meeting from there. As it turns out, according to numerous sources, Yang had had enough, and had finally realized that perhaps the many players in the ongoing Yahoo drama inside and outside the company had also had enough of him. In fact, as the pressure has mounted on Yahoo to right its ever-listing ship, a lot of the rancor was being piled atop Yang, whether deserved or — in some cases — undeserved. That’s because, even after the rough time he had as CEO of Yahoo, Yang had remained unusually active in its affairs, joining internal meetings and being part of discussions about its strategic alternatives. And while he might protest that he was doing what was asked of him by the board, his status as the company founder made it hard to minimize his clout. The recent negotiations with Yahoo’s Asian partners is a case in point. While board member Brad Smith and others have been a key part of the talks to sell off parts of its stakes there — which are critical to Yahoo to complete — execs at both China’s Alibaba Group and Japan’s SoftBank both pointed to a too-strong influence of Yang in the deal as a possible stumbling block. Yang served on both the boards of Alibaba and SoftBank’s Yahoo Japan, so his interest would have been obvious. But sources involved in the talks would often blame him for their rocky nature and difficulty. “Jerry just does not want to sell,” one said to me last week. Maybe he didn’t or maybe he did, but one thing was clear: Yang had become a lightning rod for a lot of the trouble Yahoo has gotten into over the years. That was true with major investors, who have been more loudly saying of late to its board that his continued presence was a problem. The most vocal, of course, was Yahoo’s activist shareholder Daniel Loeb, who has called for Yang’s ouster, and has been contemplating a proxy fight to make it so. Loeb was out in Silicon Valley last week, talking to possible alternate board members, many of whom have been longtime colleagues and even friends of Yang, and took the meeting anyway. Worse, perhaps, was the prospect that Yang has also been losing his most ardent fan base: Yahoo employees. With all the mishegas over recent years, they had also begun to question his role as a leader in the company, many voting with their feet by leaving in droves. With a new CEO in place, and the possible chance that its Asian problems were moving in the right direction, it had to have sunk in for Yang that it had finally become time to make peace with the present by abandoning his future at Yahoo.